As you come up to the memorial you can see the long pathway that leads to the circle. 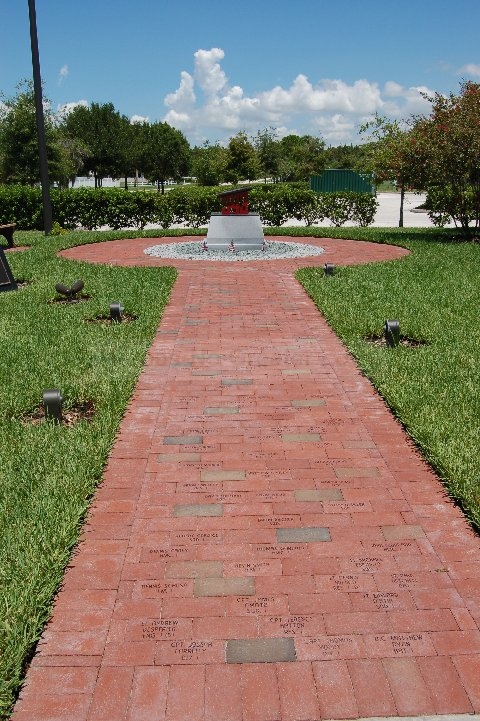 This pathway made of brick contains the names of all the 343 firefighters, and officers who gave their lives on 911. Firefighters to Oldsmar Firefighters and the Community. It has been placed with #343 in the traditional firehouse red. The # 343 represents the number of active duty firefighters lost on 911. However, there were more firefighters who gave their lives that day to save others. If we include the retired & volunteer firefighters, fire patrolees and EMT's the number increases. To the left is a bench where visitors can come, sit, & reflect after walking around the memorial in remembrance.